The past week and a bit has been full of wonderful celebrations. On the 3rd I celebrated my birthday with my wonderful family and friends. Usually I don't do much for my birthday other than a quiet dinner, however, this year I felt it would be good to get everyone together to celebrate. It actually became a joint birthday party with one of my hubby's friend from elementary school. His friends and my friends were a bit too encouraging with the drinks. At one point in the evening, I suppose I decided to sing La Bamba. I don't remember this!! Oh dear! Then we celebrated Christmas on the 7th. We had a lovely service then ate lots of turkey and all the trimmings. That first week of January always goes so quickly yet it is nice for things to get back to normal so to speak. We still need to take down our Christmas tree but we are both dreading the process. Going back to work was a bit of an adjustment. I enjoyed seeing the children but didn't like getting up at 5:30am again. I am not a morning person, whatsoever!! On the stitching front, I started my new sampler, worked on WIP's and started a few little stitches. I also received a few gifts from Nia, Shirlee, and Vickie. Shirlee made me the most darling little PS ornament. She finished it perfectly and I placed it on my tree right away so I could enjoy it for a little while. Thank you so much Shirlee! I will treasure it always. This is my first stitched Christmas ornament from a friend. A very special gift indeed!! Dear Nia sent to me a sweet little chart to stitch called Love Birds by Crescent Colours as a thank you for sending her a Tatty Teddy chart. It included the luscious Belle Soie silks! I had never tried these silks before. I am now quite the fan!! Thank you sweetie!! I'm so excited for her baby Lourenco to be born. He's going to be one well dressed baby!! I started stitching it on Friday night on 32ct Platinum Belfast linen. Vickie sent me some lovely homemade pins and a beautiful card. I forgot to take a photo of the card! Oops! Thank you my dear. I will use these in my finishes this year!! I also sent Vickie a little gift too. I stitched it awhile ago when I saw the pattern and thought of her. We have become sisters in Christ so I thought it fitting to stitch her this. It's a freebie from Feathers in the Nest. I stitched it on 40 ct. legacy linen with various silks. (I will have to email Jennifer for the link as it seems to have disappeared). For one of my oldest and dearest friends, I made a Blackbird Designs Box for her. Since she has received it I can show it now. I used a pattern from BBD's Flowers of the Field book using the recommended threads and a mystery linen. I painted the box a pretty robin's egg blue and finished it with Victorian Motto's chenille trim. I am glad she loves her box!! Another Christmas gift I stitched up was for my sister. She requested a monogram awhile back and am happy that she loves her "C"! This is for you my darling sister!! 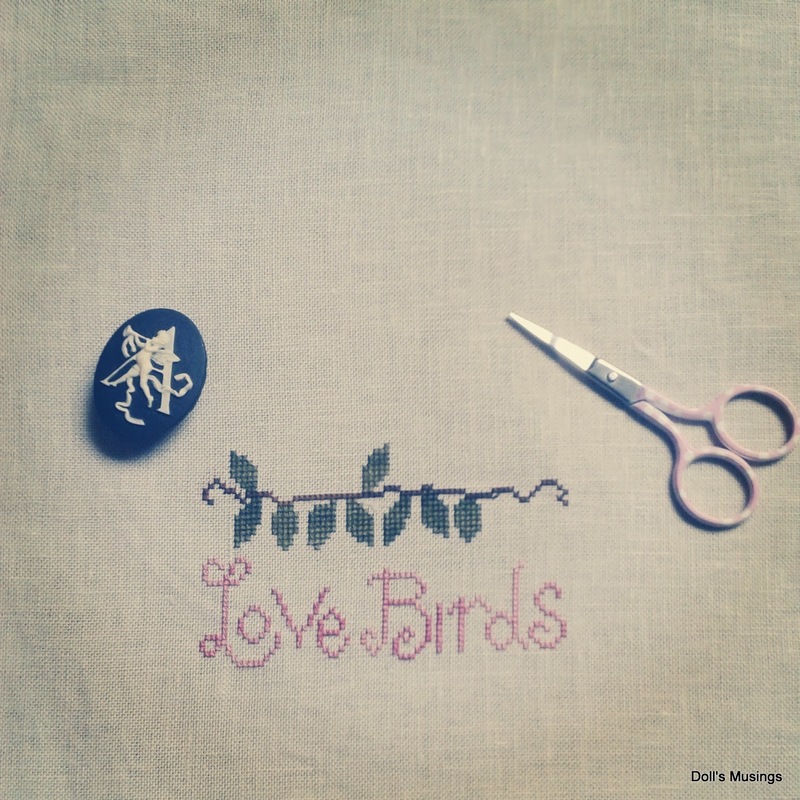 I stitched it on dove grey 32 ct linen with DMC ecru using a pattern from Sajou. Now onto my new start, JCS 1707 from the Scarlet Letter. I started it on New Year's Day, made a mistake, frogged it, then restarted again last night. Not much to show though. I am using NPI, DMC and AVAS threads on 36 ct. Newcastle linen in cream, the same as Hannah Brassington. I just love that linen so why not stitch on it again!! Teeny tiny start from the upper left hand corner. I also made some progress on my WIP's. I stitched a beet on Shakespeare's Peddlar's Magic Garden 5 stitches off so I hope I can fudge the rest of the pattern. I just don't have the heart to rip out the beet. A wee bit of progress on Knotgarden and Teabath fairy. I didn't take a photo of TBF for the progress is barely visible. If you got this far, congrats!! Thank you all for your wonderful comments on my 2013 stitching. I haven't responded to all of your comments nor visited all of your blogs but I hope to make that happen soon. I have a wee bit of work to do for school so that will have to be finished first. I have noticed lots of people posting daily with their crazy challenges and WIP's. I decided to not be a participant in any of the challenges this year. The reason being is I have a hard time committing when I'm working plus all the health issues we are trying to deal with. My hubby had a test on Friday so we are waiting for the results tomorrow. I am praying everything will be ok. Please send a few our way as I know you all will. 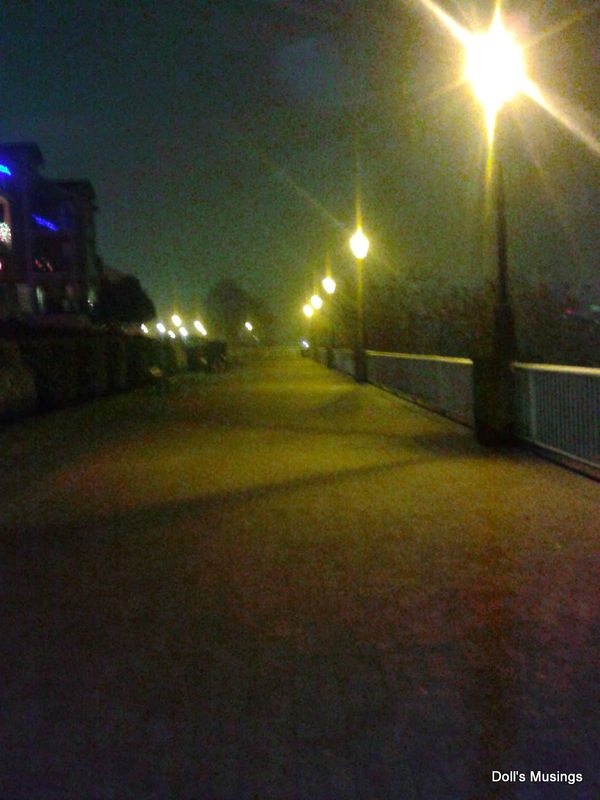 Oh, here's a foggy photo of our New Year's Eve walk to the river. It was so magical and romantic since we were the only ones by the river! What a great post, full of goodies, gifts and new starts!!! I agree with Mii a lovely post Anne, I am not a morning person either , Love your new starts and I have magic garden to do so will be watching yours. Super gifts both sent and received. Prayers of course for your dh. A great newsy post. You and I agree! I loved teaching but the up at 6am not so much. I have often said the best thing about being retired is that I don't have to get up so early. 8 is my usual wake up time now. You are doing some lovely stitching! Great stitching Anne. I enjoyed reading the post. Wonderful gifts! Love your new starts and wips, will follow your progress! Sending prayers and positive thoughts your way for your DH. Lovely, lovely stitching. Those Belle Soie silks are fantastic, aren't they? Sending prayers for your hubby's health. Hoping all will be well for your husband. Lots of lovely stitching in this post. The piece you stitched for your sister is so pretty! Fingers crossed that all is well with your hubby's test results. You got spoiled and are stitching so beautifull. Lots of lovely gifts you received and pretty things you made too. 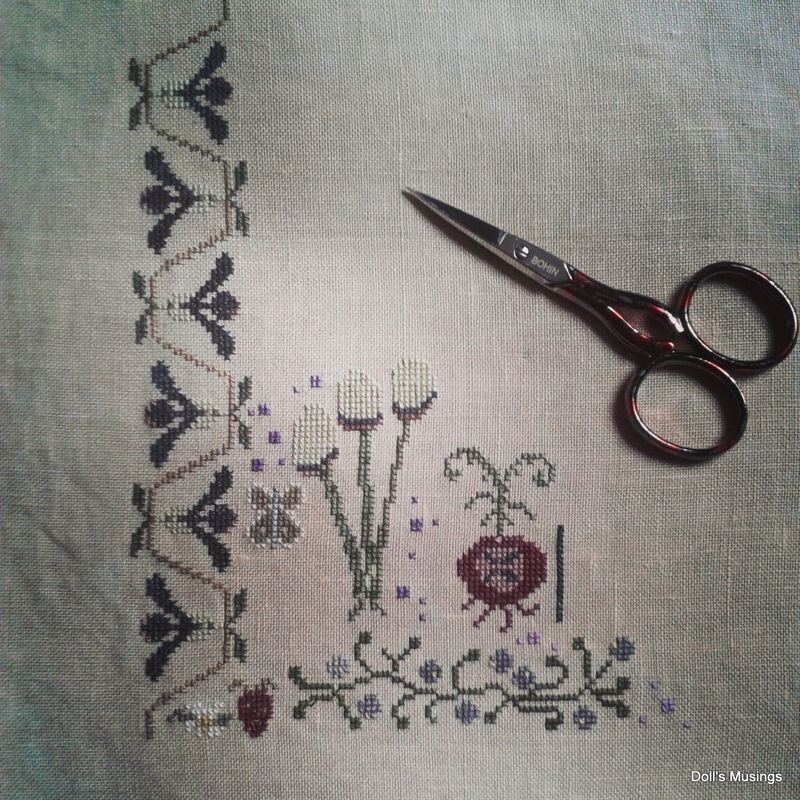 A great post with lots of gorgeous stitching. Lots of prayers for your DH -- I hope the test results come and are helpful and solve his health problems. Love seeing all the stitching, both given and received! Love your new SL start too -- that's another on my to-stitch list. Getting up at 5:30am is not fun! Eww! You've sent and received some beautiful stitching! Lovely Post! Belated Happy Birthday Anne! You've had lots of lovely gifts and I like what you made for your sister! Wishing you and your hubby all the best for a Happy, Healthy New Year! Lots of lovely things to see, I don't know how you find the time when teaching. I know how all consuming it can be. Best wishes for the test results, I pray for a good outcome for your husband. Health worries are the worst. Lots of fun stitchy things going on! And I'm laughing right now thinking of you a bit tipsy and singing La Bamba! Sending continued good thoughts for your DH. Happy Belated Birthday Dear Anne and best wishes for the new year to you and your hubby. I hope he gets to feeling better real soon. Great gifts to and fro. You're so good to be able to stitch and send gifts. I am so behind. Great start on JCS!! Great post! So many gifts and then your projects--terrific! The CC project is going to be so sweet. I have the Shakespeare's Peddler piece in my stash too! You MIGHT inspire me to start it too! Hugs! What lovely gifts both given and received. Beautiful stitching all round. I hope this is a better year for you than the end of the previous one. It's always a bit hard to get back into the swing of things after vacation, isn't it? The first week was always a bit tiresome for me, but after that I was used to it again. YOu received some very nice gifts from your friends. Also the ones you sent are so beautiful. And wow, you chose a great chart for the start of the new stitching year. Love your WIPs as well. Magic Garden is also on my wish list, it's such a lovely design. I wish you a lot of fun and stitching time for all of your projects. I hope that the tests will soon show more about your DH's health and how the doctors can help him. You've had quite a few finishes lately. They all look wonderful. Hope the DH's test results come back okay. Sending positive thoughts your way. Ooooo, so much wonderful stitching here!!! Such lovely gifts and new starts. It's a real treat to see it all. Lots of good thoughts for your hubby! Beautiful gifts both sent and received. You have some wonderful WiPs. Such beautiful gifts--the ornament from Shirlee is so beautiful. And your stitching is looking wonderful as always. A great post and such lovely stitching. A belated happy birthday! Happy Happy Birthday Anne! It looks like you had a wonderful celebration. Gorgeous gifts made and received and wonderful starts in 2014! Oh! I didn't know about your b-day!! Happy birthday sweetie :))))) Sorry I'm late.. Sorry I'm behind on my blog reading also! 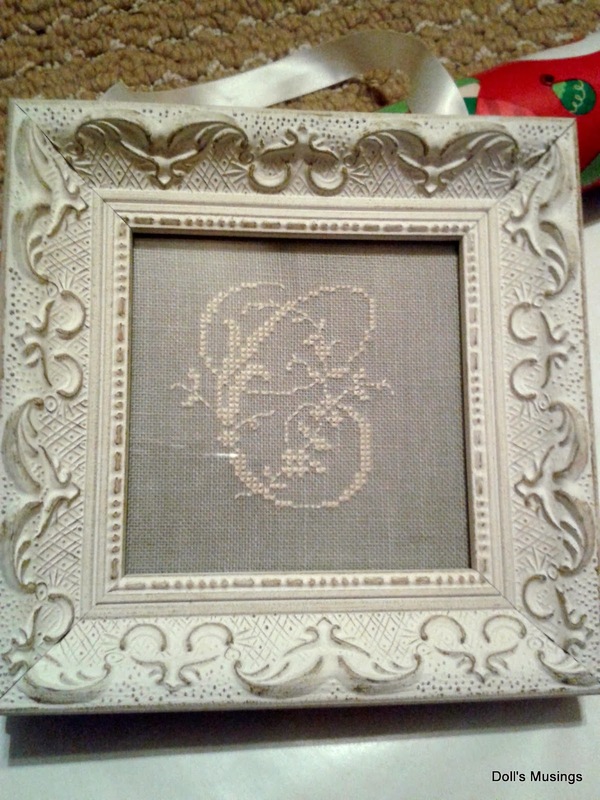 Love the frame on the monogram, and the color combination is so delicate, now I want to stitch one! You are the only person I have ever heard describe a walk as "magically romantic," a phrase I have begun to associate with your marriage. I am glad your new year started out so well! Loved this post ~ a very Happy Birthday to you! Lovely goodies ~ given and received ~ and such great stitches!